A warm Australian November, a friendly, collaborative conference: what’s not to like? OzCHI always attracts a proportion of Scandinavians and Brits who are happy to escape to the sun. And to add to the attraction, the theme of OzCHI 2007 was ‘entertaining user interfaces’. Our keynote, from Blair MacIntyre of Georgia Tech, firmly set the tone for the conference. He’s been exploring augmented reality experiences, focusing primarily on the intense computational challenge posed by making the tools for creating the experiences. In his wide-ranging talk, we saw snatches from an augmented reality Alice in Wonderland tea party and a guided tour of an Atlanta cemetery. His world of collaboration between artists and technologists is a long way from mine, but we came back firmly to the purposeful when he touched the work of his colleague Ian Bogost who is studying video games as cultural artefacts. Doesn’t sound very purposeful? 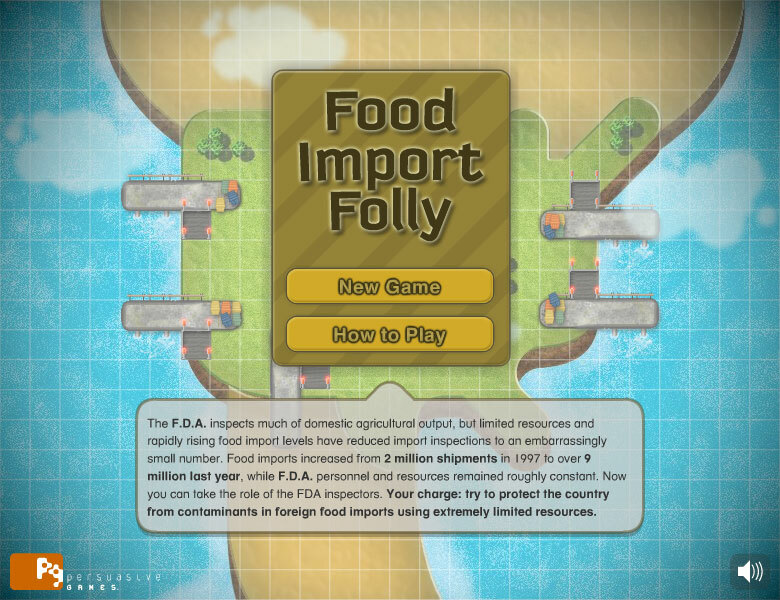 Well, the New York Times is featuring games from Professor Bogost’s ‘Persuasive Games’ company as part of its editorial (Op Ed), for example ‘Food Import Folly’. immersive experiences increase the sense of being located in the experience (“presence”), but don’t necessarily increase the feeling of engagement. He pointed out that part of game-playing is talking about the game (“meta-play”), which is harder to do if you’re in the game. Usually at conferences I feel obliged to rush from track to track, picking the papers which seem most ‘useful’. But this conference had a flight of stairs between the two lecture halls, so my walking difficulties meant that wasn’t an option. And serendipity rewarded me: I learned a lot, even from the speakers who are working on ideas that are far, far away from my world of government and non-profit websites and forms. For example: augmented reality definitely isn’t just about games. To pick just a few examples, we had augmented reality to allow a medical expert in one location to advise, direct and diagnose a team with a patient elsewhere. We had augmented reality for helicopter pilots, where ‘mission failure’ was equated with being shot down. We had many interesting explorations of the challenges of allowing small groups to collaborate: increasingly important in these days of distributed teams when we’re all trying to reduce our travelling times and our carbon footprints. (Note to self: better remember to buy my carbon offset for the long flight to get here). It also struck me that the researchers were happy to use fun tasks to explore their serious technologies. Participants in experiments built Lego sets, solved jigsaw puzzles, shared photos. And why not? Experiments, like interfaces, should be fun. And in general, it seemed to me that there was overall a much greater focus on concepts of enjoyment, satisfaction, and engagement than we used to see a few years ago. As one speaker pointed out: it’s not just about whether users can use these technologies, it’s also about whether users want to use them. It also struck me that many researchers are exploring the boundaries of systems in a very interesting way. There were several papers at this conference on the topics of gesture and engagement in remote systems: how people use gesture, and how to improve collaboration through the use of gesture. And in a topic very dear to my heart, Jason Pascoe told us about a diary study on the use of ‘mobile tools’, by which he meant all types of tools, paper and other non-electronic tools included. Paper! I especially enjoyed his anecdote of a participant who was convinced that she never used paper, until her diary revealed that she puts notes on the cat’s bowl for herself, notes on the coffee table to talk about with her husband, bills in the car because she drives past the bank on the way to work… and more. She was surrounded by paper, and hadn’t noticed it.